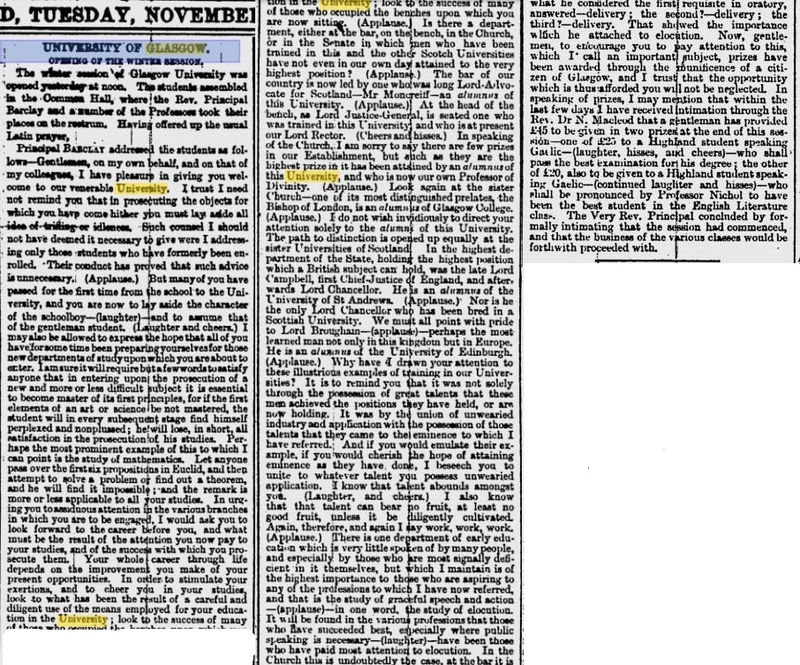 1847, Nov 5, p.1. 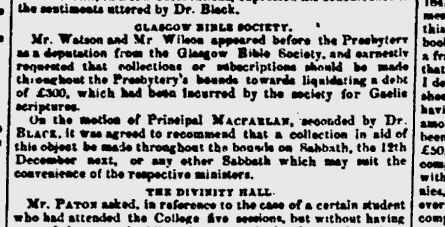 Principal MacFarlan & the Gaelic Bible (Glasgow Herald). 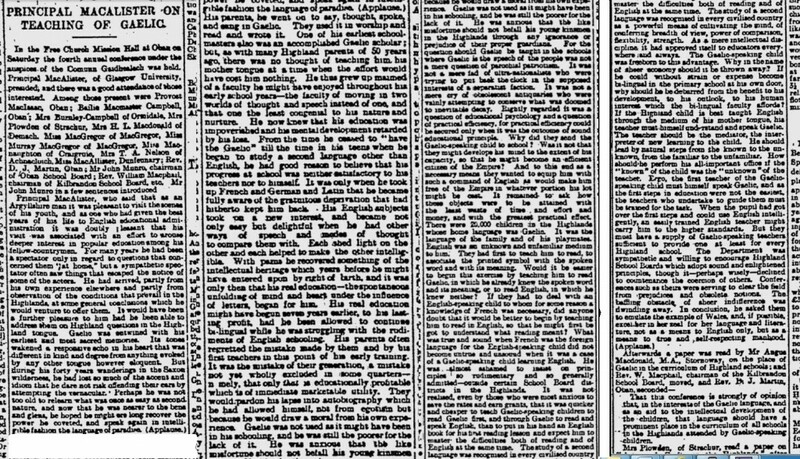 1849, Mar 26, p. 4. 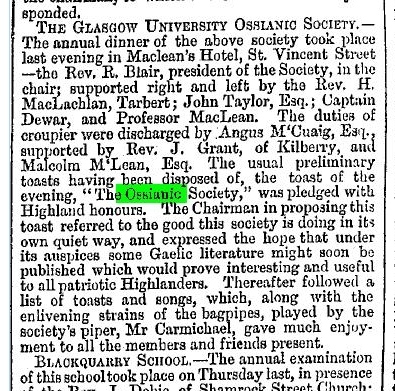 An Comunn Oiseanach & their Annual dinner (Glasgow Herald). 1852, Mar 29, p. 6. 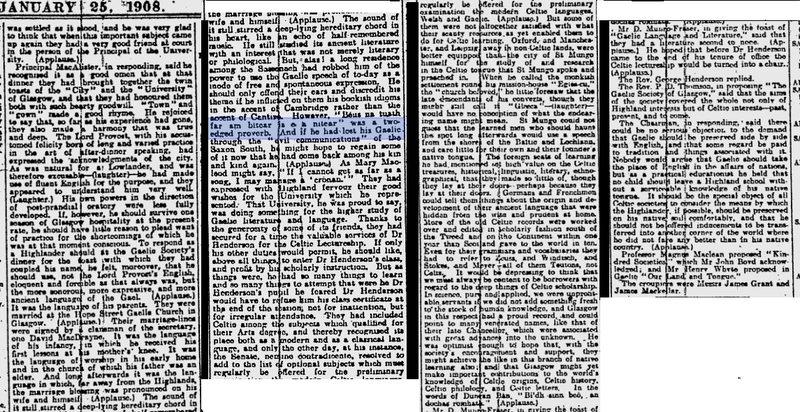 An Comunn Oiseanach & their Annual dinner (Glasgow Herald). 1856, Apr 14, p. 10. 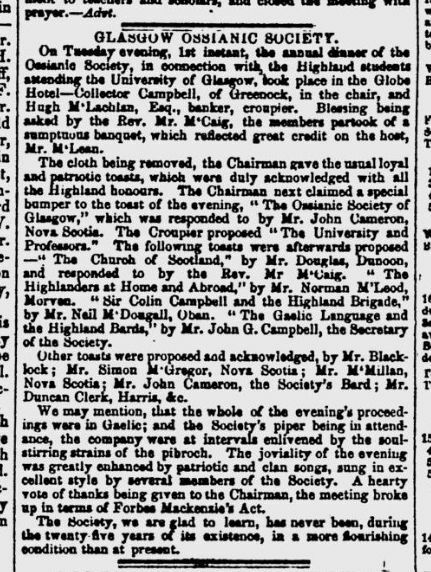 An Comunn Oiseanach & their Annual dinner (Glasgow Herald). 1857, Apr 1, p. 5. 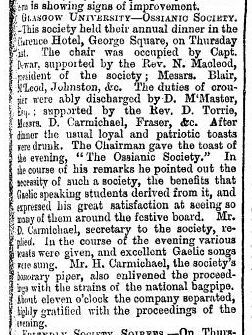 An Comunn Oiseanach & their Annual dinner (Glasgow Herald). 1861, Apr 1, p. 10. 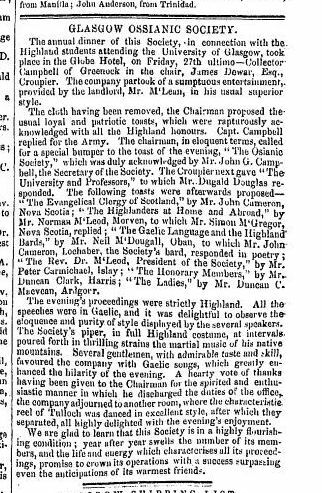 An Comunn Oiseanach & their Annual dinner (Glasgow Herald). 1865, Mar 25, p. 5. 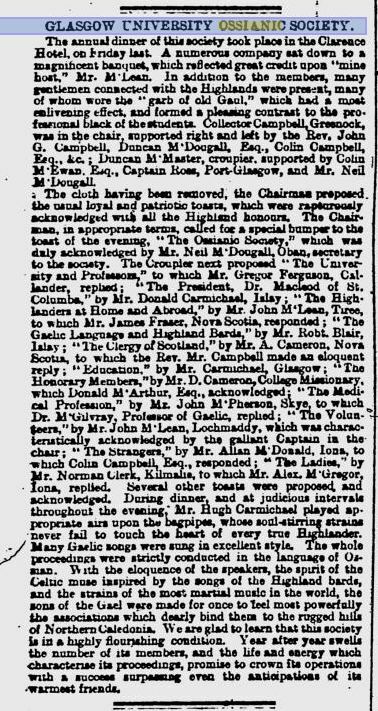 An Comunn Oiseanach & their Annual dinner (Glasgow Herald). 1867, Nov 5, p. 2. 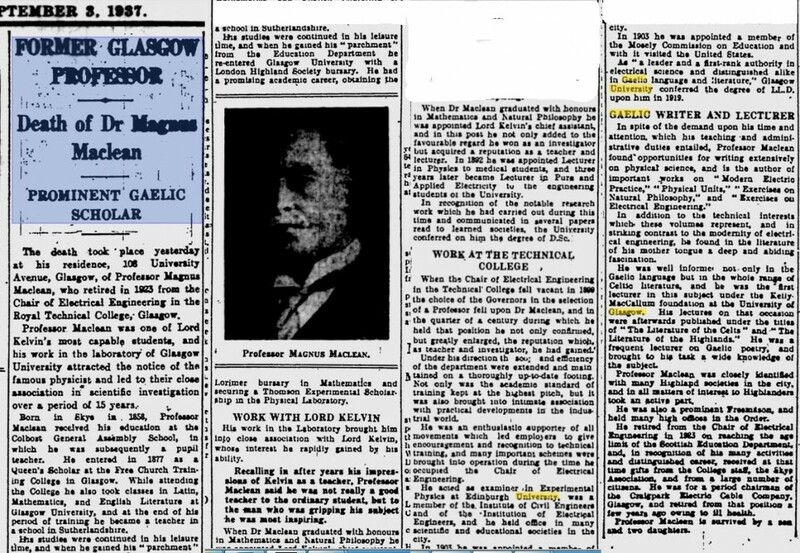 Principal Barclay & Gaelic prizes (Glasgow Herald). 1870, Mar 26, p. 6. 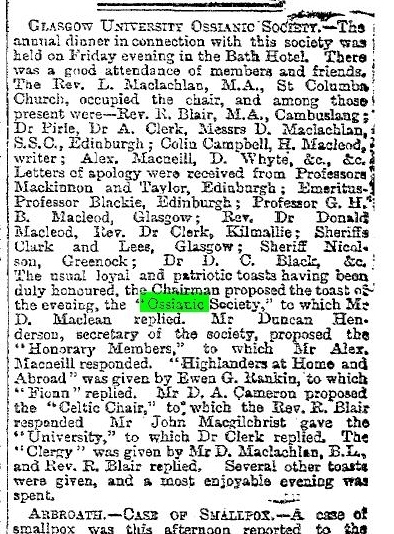 An Comunn Oiseanach & their Annual dinner (Glasgow Herald). 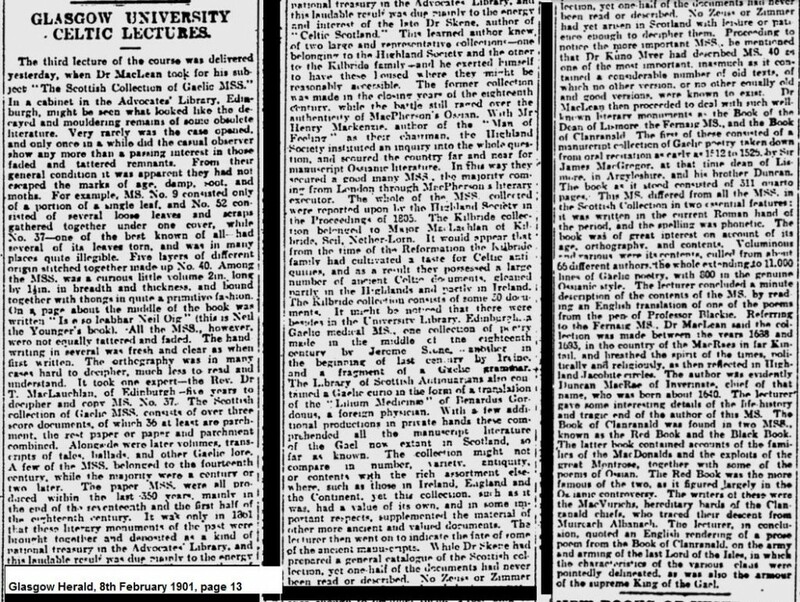 1886, Mar 29, p. 5. 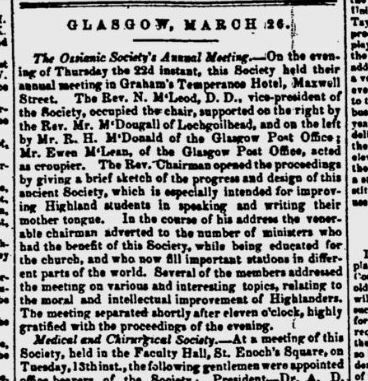 An Comunn Oiseanach & their Annual dinner (Glasgow Herald). 1894, Jun 19, p. 7. 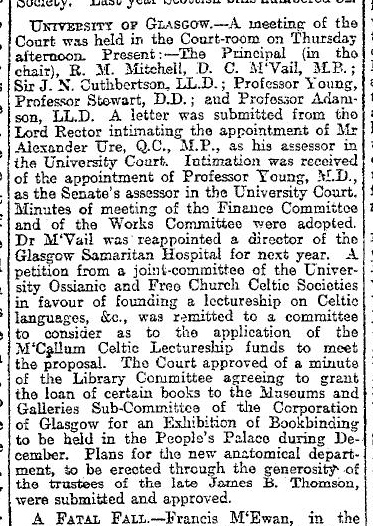 The MacCallum Bequest & the University Court (Glasgow Herald). 1895, Jan 15, p. 7. 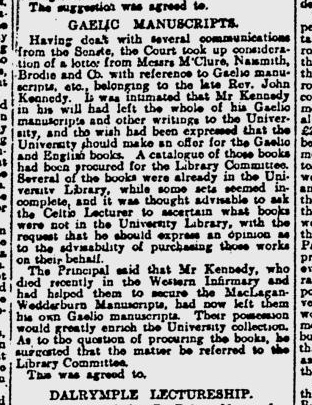 MacCallum’s Library & the University Court (Glasgow Herald). 1899, Dec 18, p. 6. 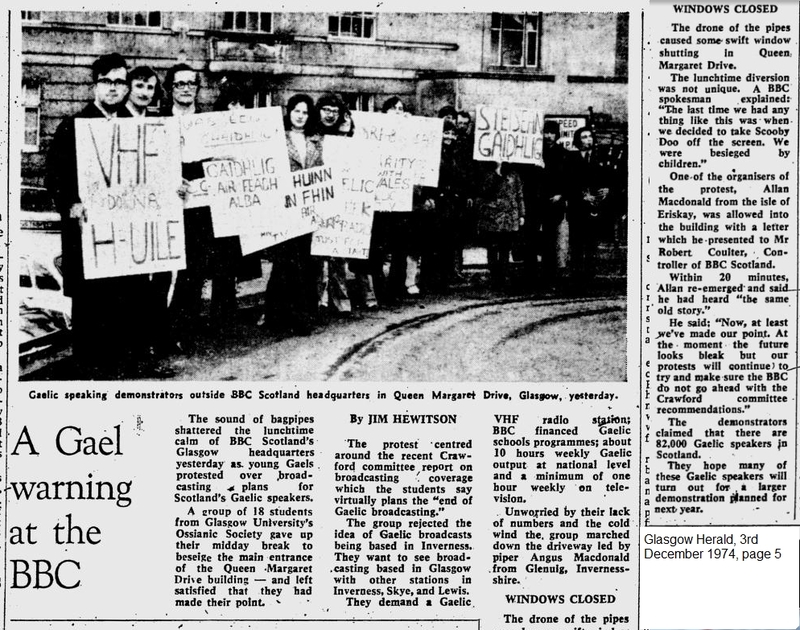 A student petition to the University Court – An Comunn Oiseanach, lobbying for the introduction of Celtic or Gaelic at the University (Glasgow Herald). 1901, Jan 25, p. 4. 1901, January, 25th (p.4). 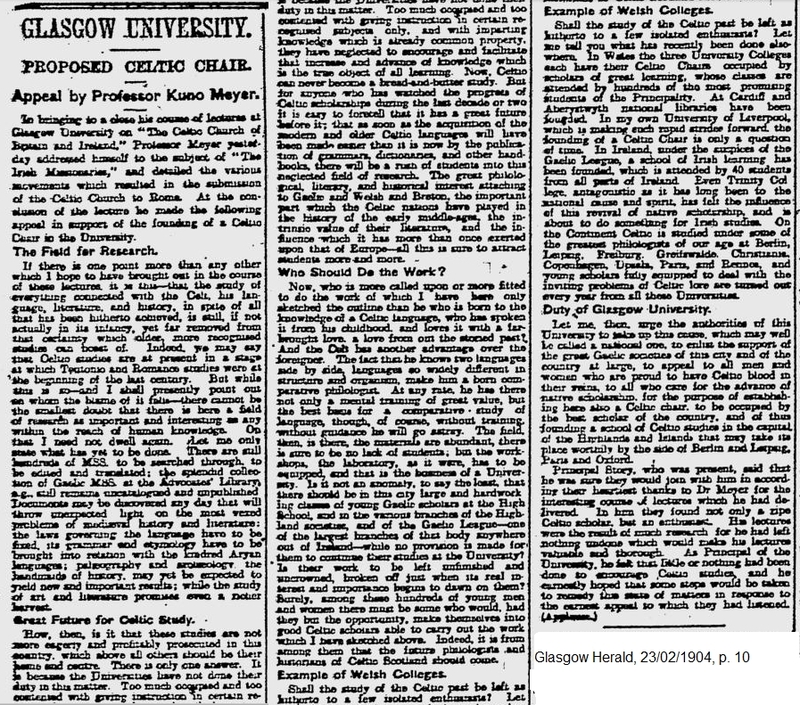 The first ever official Celtic lecture at the University of Glasgow took place on the 24th January 1901. 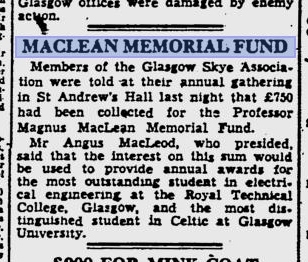 This was given by Professor Magnus Maclean, a lecturer in electrical engineering, appointed to deliver a series of public lectures on Celtic at the University under the terms of the Rev. 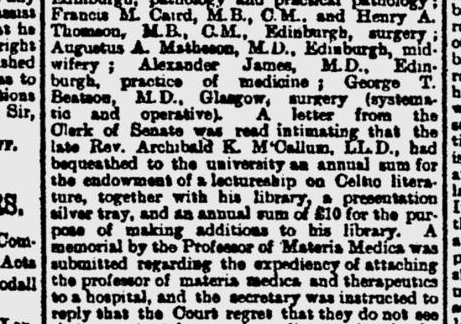 Dr Archibald K. MacCallum’s bequest (Glasgow Herald, 25th Jan 1901, p. 4). Two images. 1901, Feb 8, p.13. This is how another one of Maclean’s lectures, from his first season as Kelly-MacCallum lecturer, was reported in the Herald. 1904, Feb 23, p. 10. Professor Kuno Meyer followed Maclean as the Kelly MacCallum lecturer, 1903-06. He continued his work at the University of Liverpool, visiting Glasgow to deliver his series of lectures (six per year over a three year period). 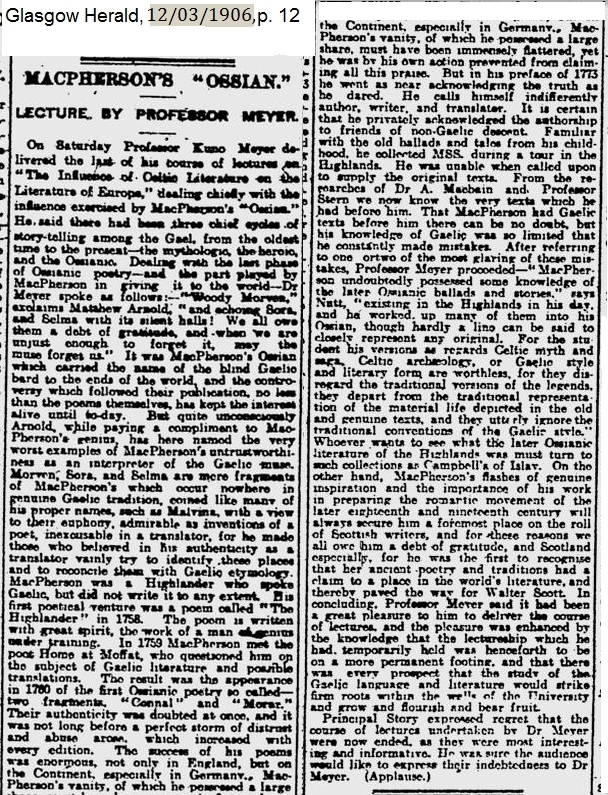 Here is how one of these lectures was reported in the Glasgow Herald. 1906, Apr 13, p. 9. The Rev Dr. George Henderson was the first full time lecturer of Celtic and the first to teach students taking Celtic as a degree course, 1906-1907. This was the first intake of students who took Celtic as a degree course. 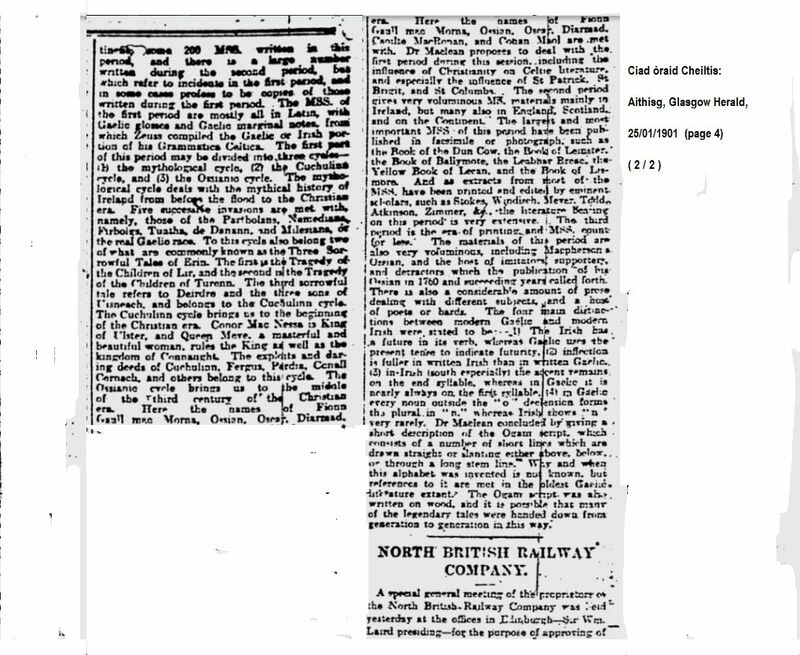 Only three students enrolled for Celtic in its first year: Malcolm Laing (Lochmaddy), Archibald Maclean (Cornaig), Alexander Mackay (Strathy). 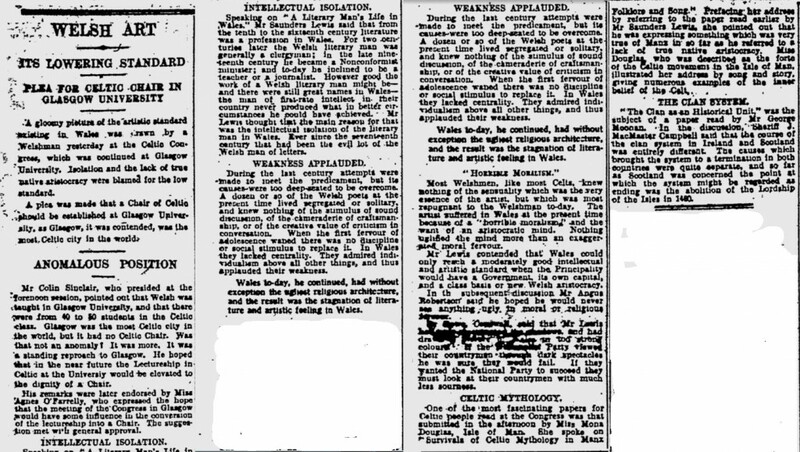 1908, Jan 25, p. 8. 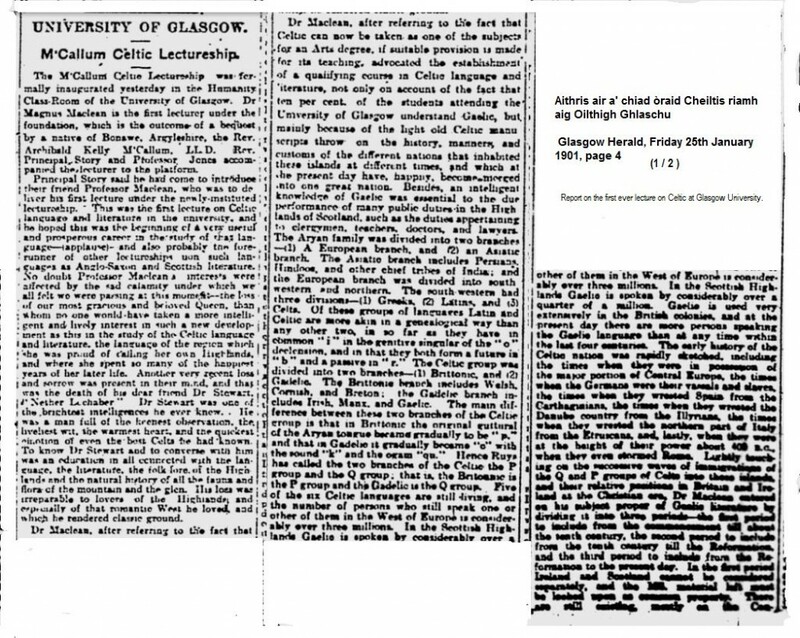 Comunn Gàidhlig Ghlaschu – Annual dinner & University Principal, Donald MacAlister and his views on Gaelic (2 x images). 1908, Jul 6, p. 11. University Principal, Sir Donald MacAlister, and his views on Gaelic education. 1909, Jan 15, p. 10. The library of Alexander MacBain & the Dept of Celtic. 1910, Jan 14, p. 9. The MacLagan Manuscripts donated to the University of Glasgow. 1910, Jun 08, p. 10. The manuscripts of the Rev. John Kennedy granted to the University. 1912, Jun 29, p. 4. 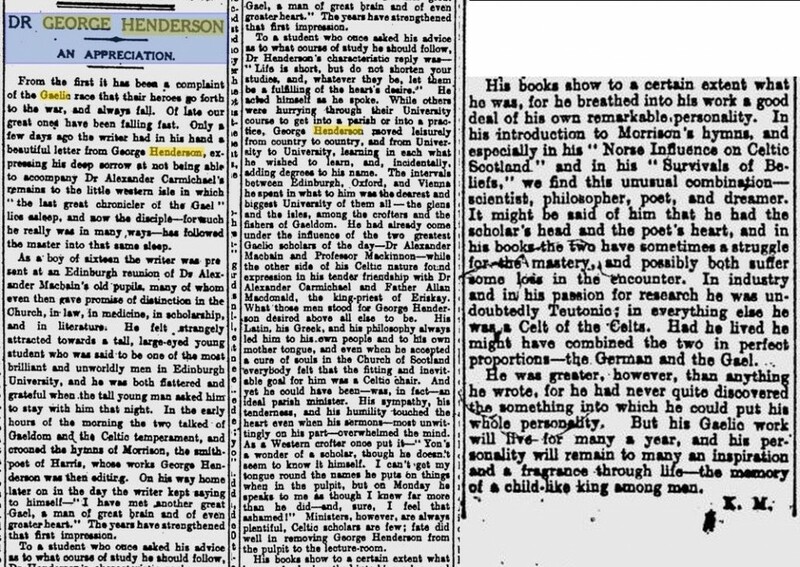 Obituary for the late Rev Dr George Henderson by ‘K.M.’ (Kenneth Macleod ?). 1912, Oct 04, p. 8. The appointment of the Rev. 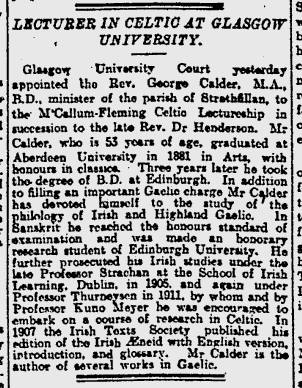 Dr George Calder as the new Fleming-MacCallum Celtic lecturer. 1926, Feb 01, p. 7. Annual Gaelic religious service in Bute Hall. 1929, Sep 16, p. 25. 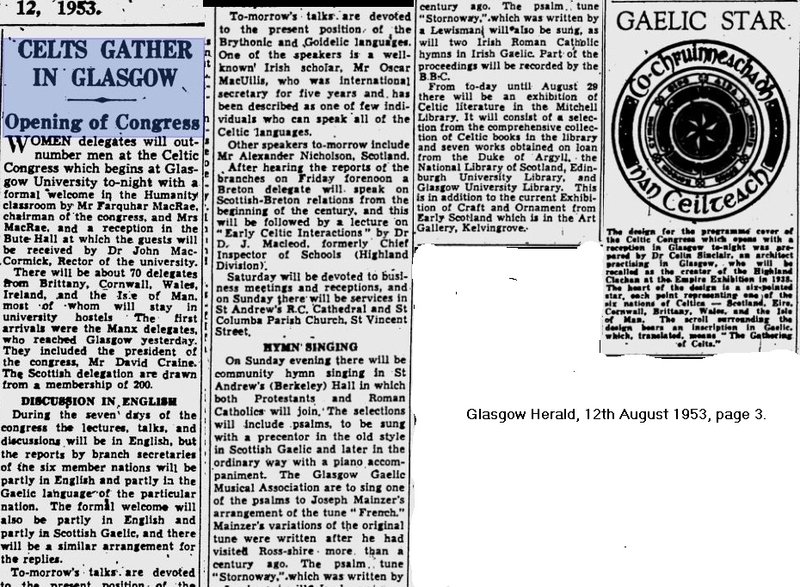 News of impending Celtic Congress in Glasgow. 1929, Sep 27, p. 9. 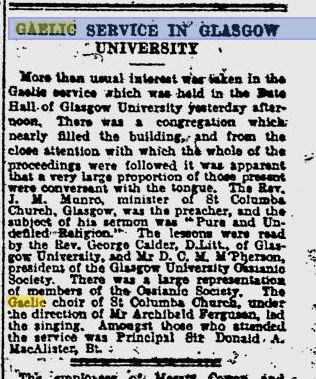 Report on the Celtic Congress in Glasgow. 1930, Jan 25, p. 7. An Comunn Oiseanach – annual dinner. 1930, Feb 17, p. 13. Annual Gaelic service in Bute Hall. Three newspaper cuttings showing a criticism of the ‘despised lectureship’ at Glasgow and responsed to this. 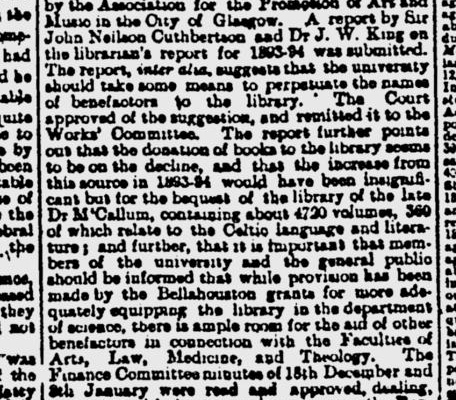 The first of these is a report of a speech made by John McCormick which identified reasons for the decline of Gaelic in Scotland, stating not enough was being done, singling out the ‘despised lectureship’ at the University of Glasgow. (3rd October, 1930, p. 6). This drew a response from the Rev. 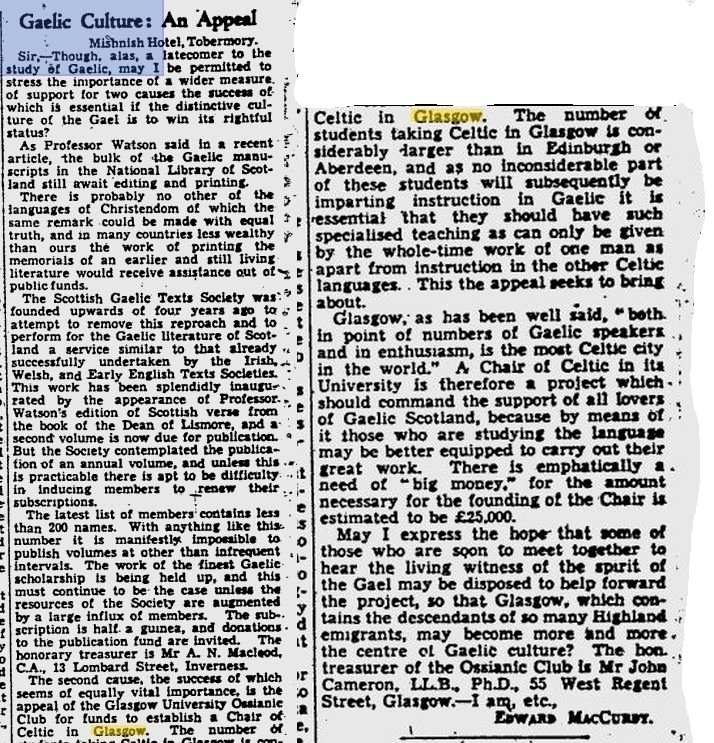 Dr George Calder, the second cutting pictured here (7th October, 1930, p. 9), against the attack on the Celtic lectureship, stating that he, Calder, in fact, turned out more Gaelic graduates than anywhere else. 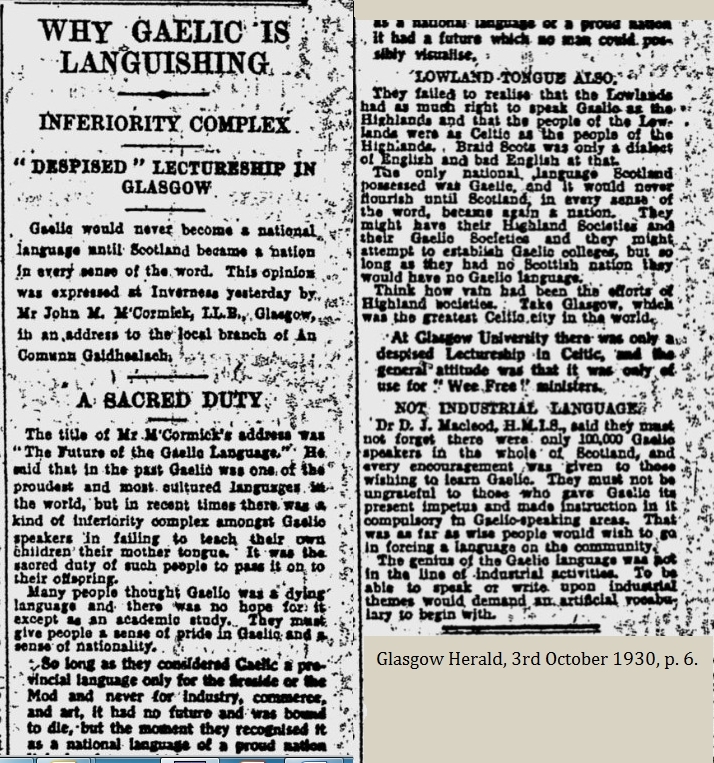 McCormick then responded to Calder’s complaint the following day (8th Oct, 1930, p. 9)- complaining that nowhere near enough was being done to attract people to the study of Gaelic. 1931, Dec 14, p. 10. Dinner celebrating centenary of An Comunn Oiseanach. 1935, Oct 02, p. 15. 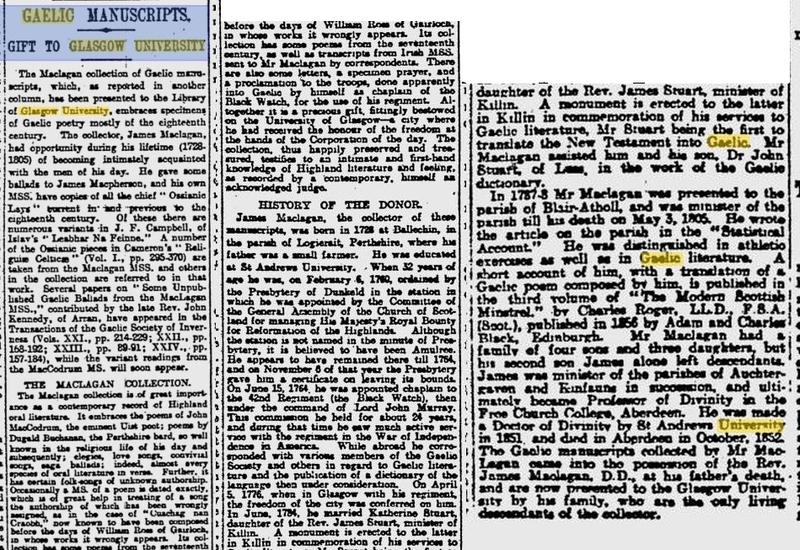 J. Carmichael Watson employed as a lecturer of Celtic literature at the University of Glasgow. 1937, Feb 20, p. 9. 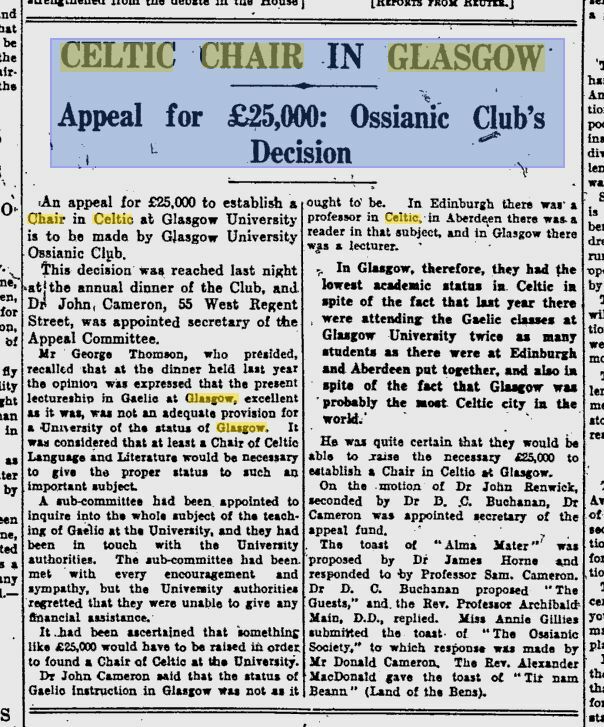 An Comunn Oiseanach raising funds to help establish a chair of Celtic at the University of Glasgow. 1937, Sep 3, p. 13. Obituary for Professor Magnus Maclean. 1938, Feb 12, p. 13. An Comunn Oiseanach’s campaign. The first £900 has been collected towards the foundation of a chair of Celtic. 1938, Feb 18, p. 12. Annual dinner of An Comunn Oiseanach and a report on the progress of the campaign for the Celtic chair. Mention of Miss Mary A. Maclaine, the first female president of the Club (30 years earlier?). 1938, Sep 2, p. 13. Subscription list of those supporting An Comunn Oiseanach’s campaign to raise funds to fund a chair of Celtic. 1938, Sep 26, p.9. 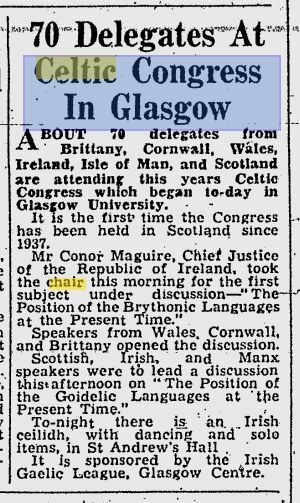 Letter to the editor about the Scottish Gaelic Text Society and the need for a chair of Celtic at Glasgow, from Edward McCurdy. 1938, Dec 9, p. 7. 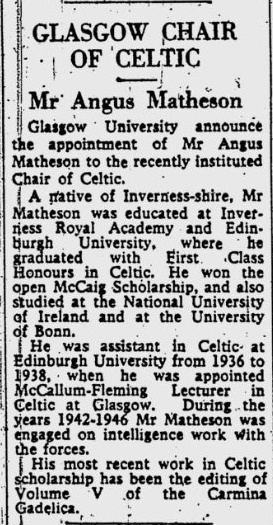 There were now two lecturers in the department of Celtic… Dr Angus Matheson and Kenneth Jackson. 1941, Apr 2, p. 9. Obituary, Rev. Dr. George Calder, former lecturer. 1946, Oct 14, p. 4. Update on the Comunn Oiseanach’s campaign for the chair. 1947, Dec 6, p. 6. Glasgow Skye Assoc. & the Magnus Maclean prize. 1953, Aug 12, p. 3. Celtic Congress, starting tomorrow at Glasgow University. 1953, Aug 13, p. 4. 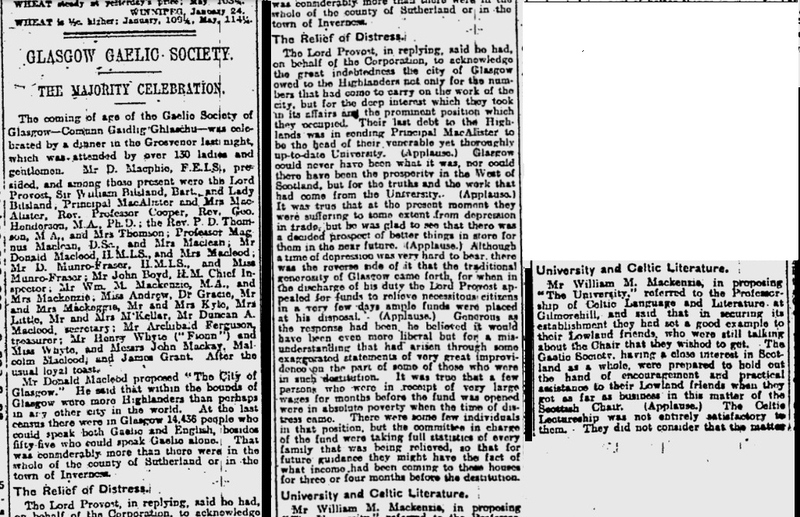 Report of the day’s proceedings at the Celtic Congress. 1955, Oct 11, p. 3. 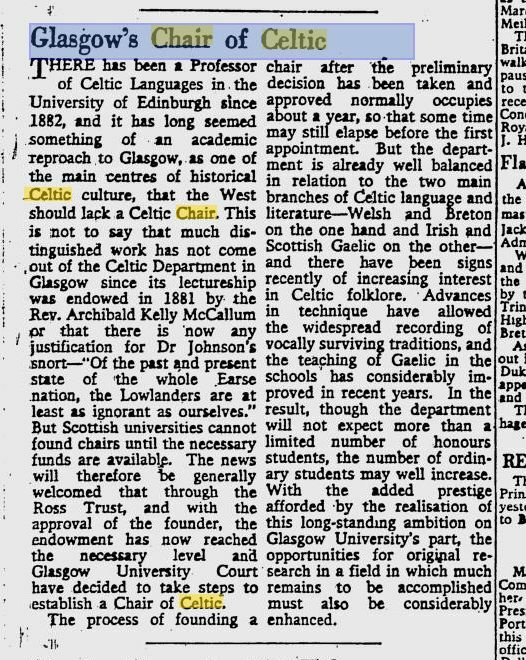 Glasgow University Court gives the go-ahead to the Celtic chair. 1955, Nov, 05, p. 6. At long last! 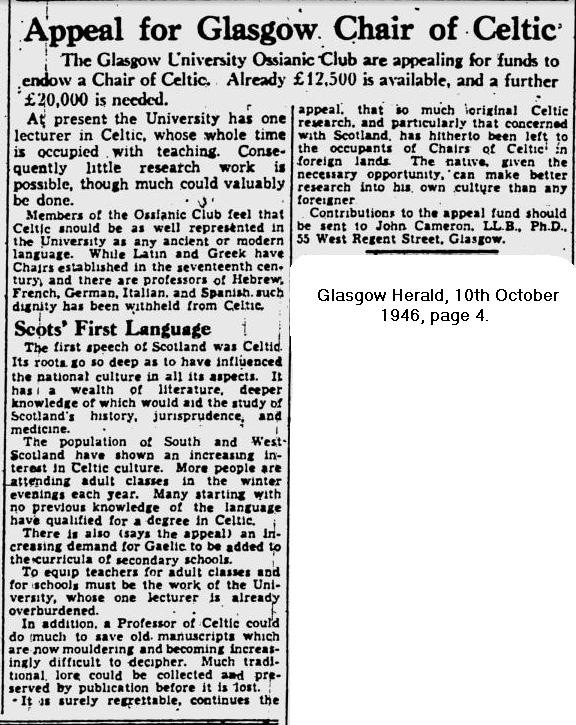 A chair of Celtic for the University of Glasgow. 1956, Nov 29, p. 6. The appointment of Angus Matheson to the new chair of Celtic. 1963, May 09, p. 10 Student drama, including players from An Comunn Oiseanach. 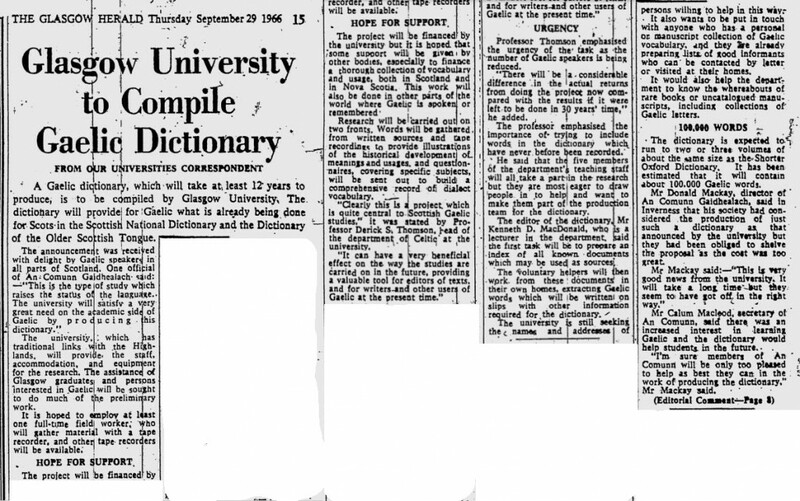 1963, Aug 05, p.6. Derick Thomson appointed to the Chair of Celtic. 1966. 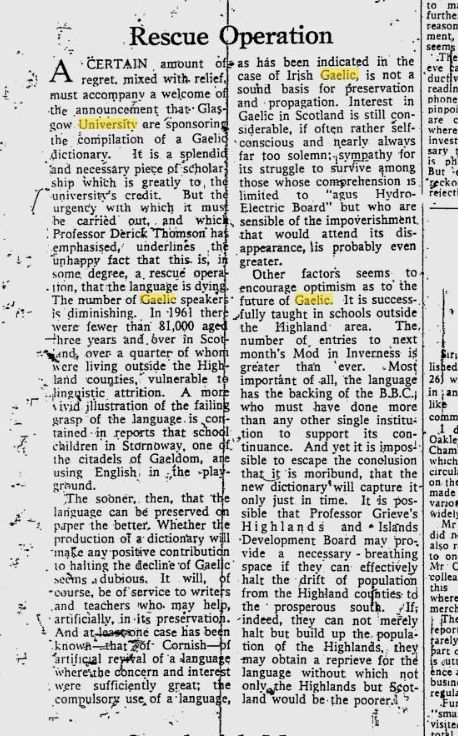 Sep 29, p. 15 News on the Historical Dictionary of Scottish Gaelic. 1969. Mar 20, p. 30. New project, Gaelic learning materials entitled ‘Sàth’. 1974. Dec 3, p. 30. Protest by An Comunn Oiseanach outside the BBC headquarters, Queen Margaret Drive, against the lack of provision for Gaelic broadcasting.